2014 has been a landmark year for Lima-based DBLUX S.A.C. 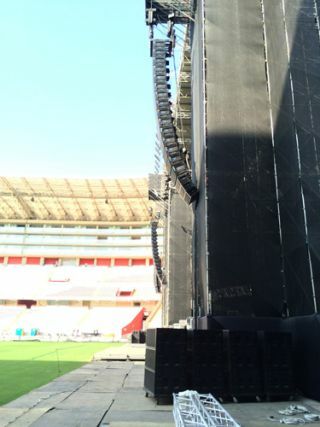 With a Meyer Sound LEO linear large-scale sound reinforcement system, founders Andres Cuadros and Guillermo Riera have grown the company into a rental powerhouse chosen for top international tours stopping in Peru. Artists who have performed with DBLUX’s LEO system include Paul McCartney, Metallica, Soundgarden, One Direction, Jack Johnson, Marc Anthony, Rubén Blades, and Daddy Yankee and Prince Royce. Other notable events covered by LEO include “Together in Concert,” where Latin American superstars Carlos Vives, Olga Tañón, Gilberto Santa Rosa, and Tito el Bambino performed together to an audience of 25,000. Many of the shows took place in Lima’s National Stadium (Estadio Nacional) and Exposition Park (Parque de la Exposición). DBLUX S.A.C.’s core LEO system comprises 30 LEO-M line array loudspeakers, with six MICA line array loudspeakers for down fills. Up to 36 1100-LFC low-frequency control elements provide low end, while system drive and optimization are supplied by a Galileo Callisto loudspeaker management system with one Galileo 616 AES and four Galileo Callisto 616 array processors. Exact numbers and configurations vary according to requirements, with MILO and MICA line array loudspeakers sometimes deployed for out fills or delays in large venues.